Get all your questions answered about how to use ​Flipboard​ to market your business and drive more traffic to your websites. You do have to be a member of the Mastermind Community which is free. Our guest Janette Speyer is a Flipboard expert and a multilingual Marketing Strategist & Creative Content Creator for organic food companies. 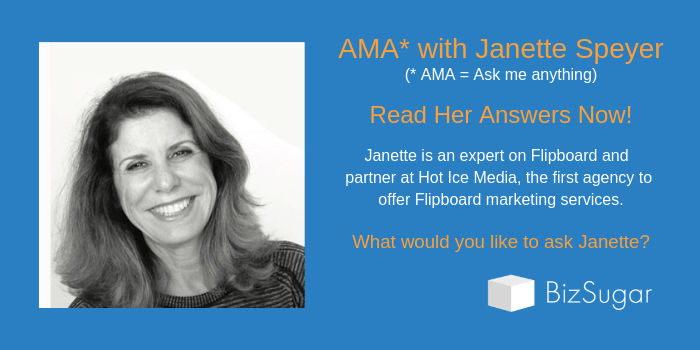 She is a partner at Hot Ice Media, the first agency to offer Flipboard marketing services. They have a full service department dedicated to marketing and promoting on Flipboard. Ask her about her ​Simple Tricks to Get Flipboard Traffic to Your Website​ and how to use it. Ask multiple people what Flipboard is and you’re likely to get many different answers. It really depends on how you use it on what device. Some people use it as a visual news reader. Think of it like a new type of Pinterest board. Others stay on it the way they would Facebook or Twitter. See how you could use it to create your own custom magazine where you choose the sources and the topics? Then you can save select articles and videos as magazines and easily rearrange the order they’re in. So just as you can save videos to a playlist on YouTube and then rearrange what order they play in, you can save items to a magazine and organize them the way you want them. Janette said, “One of Flipboard’s hidden gems is that you can become a Flipboard publisher by submitting your RSS feed and it will populate content from your blog automatically.” I wish I’d known that years ago! Here’s is what Janette’s Web Success Team blog looks like when fed to Flipboard: Web Success Team blog Flipboard Magazine.​ There is a how-to in How and Why You Should Add Your RSS Feed to Flipboard. In an ​interview on CMSWire​ for “Flipboard Is Seeing Strong User Growth: Here’s Why”, Janette described a few of the ways she uses Flipboard to benefit clients. ​Janette Speyer​, partner at Hot Ice Media and Flipboard marketing specialist, once used Flipboard to manage, monitor and track a contest. According to Speyer, “We ran this contest on Instagram. Participants had to cook a dish with a vegan cheese. We used Flipboard to track the dishes and to pick the winner.” In addition to being used to judge submissions, the Flipboard magazine served as the visual record of the contest, with the winning entry gracing the cover of the magazine. I learned to think outside the box with my own use of Flipboard. I have one magazine that features the ​content I curate in my email newsletter​. In another, I showcase ​recent books that I’ve read​. I loved reading the book “The Best American Sports Writing 2017,” so I looked up the selections in a search engine and ​placed the individual articles in a magazine​. In other words, I took an existing work of curation and gave it new life. Want to know how to leverage ​@​Flipboard for ​#​publishing and ​#​marketing? Or to promote your business? Or to find clients? Join us and ask Janette to share her experience. See answers to all of your questions about Flipboard now in the Mastermind Community! You do have to be a member of the Mastermind Community which is free. Simply click the button below to join and then once you’re a member the ‘Members go directly to the event’ button should work for you. Great post Janette. Flipboard is another great tool to add to the arsenal!